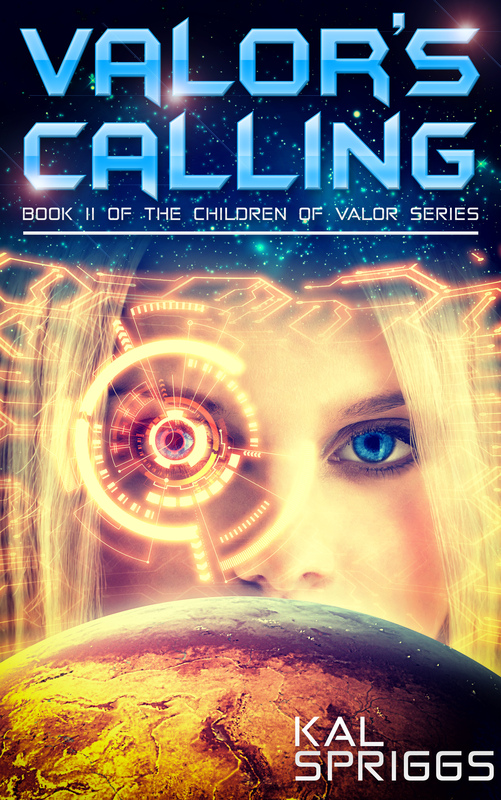 Valor’s Calling, sequel to Valor’s Child, is coming soon! The second book of the Children of Valor series covers Jiden’s first full year at the Century Military Academy. Valor’s Calling will be released on the 30th of September. Valor’s Child is now live on Amazon! Valor’s Child is the first book of my YA series, Valor’s Children. The second book of the series, Valor’s Calling, is nearly complete and I hope to have it out near the end of August. This is a quick, fast, fun set of stories and I hope you all will enjoy reading them as much as I have writing them! Jiden’s parents barely scrape out a living on the dry, dusty world of Century. Jiden wants more for herself and she is ready to step into a bright future, one which may lead her far from the frontier world of her birth. She’s just got one obstacle: five months of military school. She’ll be away from her friends, subjected to long hours and a crushing work load. Yet as the challenges mount, she finds that there may be more to life besides comfort and security… things like duty and service. You can get your copy from Amazon. And in case you’d like to learn more about my writing process and why I wrote Valor’s Child, sign up for the Century Military Academy. Here’s the fourth and final snippet for Valor’s Child. Valor’s Child comes out on Amazon on 30 June, 2017. You can find the first snippet here. I stared at the Admiral for a long time, with much the same look one might bestow on a crazy person. At first I was unable to speak. The very idea that I would want to join the military — much less go to the absurd Military Academy which the Admiral had the charge of — was ridiculous. I didn’t want to be in the military, I wanted to work for Champion Enterprises. I suppose, in the unlikely event that I failed at that, I would be an archeologist, like my mother and father. “You have no choice, girl,” the Admiral said. “You’ll go… and if you fight me on this I will drag you like the petulant child you seem to want to be.” She let out a disapproving sniff. “I could fail out,” I said. It was a desperate option, I knew. I’d never failed at anything, but it might be the only option. “You could… if you can tolerate what others would think of you, feel free,” the Admiral’s voice exuded disapproval. “For that matter, your Champion Enterprises Internship Program does accredit the Century Military Academy as a respected institution… and they will pull our records before you attend. I think that would be a case of cutting off your nose to spite your face. And trust me, failing out is the only way I will allow you to leave before this trimester is up.” I stared at the old woman for a long time. She had a look of iron-willed determination on her face. The set of her shoulders was one that I recognized from my mother, whenever she had made up her mind… yet there was something far more implacable about it. It was almost as if my mother’s stubbornness were just a minor reflection of the Admiral’s. “Fine, whatever,” I muttered and looked away. “James,” her grandmother said to the otherwise empty room. For a moment, I thought the old woman might have gone insane. Then I realized it was a communications implant. If she had that, then it only made sense she probably had a full cranial implant. The implanted device allowed someone to directly link with computers, to communicate with one another across distances… and to creep out people around them at the thought of a computer nestled in their brain. I stood there, so stunned that I couldn’t move. The metronome tick of the old fashioned clock against the wall seemed far too loud for the small room. The study, with the old stuffy furniture and the annoyingly loud clock belonged to the Admiral. In any other house, I would have felt excitement at the ranks of old, leather bound books and the strange treasures that lined the shelves. Here I just felt out of place. No sooner did I have that thought than I stood. I didn’t head straight for the doors, not right away. I didn’t know if there were some cameras or other snoops in the library. For that matter, James might appear at any moment. I walked first to the old fashioned clock. It was a complex thing of brass and glass, with whirling gears and a heavy pendulum. Another time I would have been utterly fascinated. If I were at a friend’s house, I might have asked permission to take it apart to see how it worked. Instead, I shifted slightly, as if examining the spines of the books along the shelves. The doors grew closer. The heavy wooden doors that separated the study from the Admiral’s office had kept my mom’s and the Admiral’s voices indistinct. They could not, however, silence them when those voices raised in anger. “…can’t be serious?” That was Mom, I realized. “She’s not a bad kid!” Mom said. “And I’m not going to treat her as if she was,” the Admiral snapped. Her voice dropped below hearing. I ground my teeth in frustration. It sounded as if the Admiral had some truly ghastly punishment in mind. I shifted along the bookshelves until I was almost just outside the doors, where I was able to hear their lowered voices once more. “I still feel like you’re doing this just because I didn’t follow in yours and Dad’s footsteps,” my mother said. I could hear the bitterness in her voice. “That’s the problem, it’s always your terms,” Mom said, but I recognized the tone of resignation that signaled she had conceded the fight. Come on, I thought, how bad is this punishment that even my mom thinks it’s too much? “No, it’s best I get home,” Mom said. “Wayne and I have uncovered another level in the catacombs. We’re starting to find actual equipment, some of it definitely alien, not just trash, some of it might be recoverable…” I tuned out her explanation. I’d heard it a hundred times. Mom and Dad both were passionate about their work. I’d admit, it was interesting… but it wasn’t for me. They barely scraped by, even at Basalt Mesa, while people like Tony’s father were already making enough money to live comfortably while still making a difference and modernizing Century’s technology base. What were a few alien trinkets compared to that? I responded by habit, “Love you, too.” I did, even if she made me want to pull my hair out in frustration. She pushed me out at arm’s length. “Good luck, Jiden,” she said and then she walked out of the study. I heard her talk with James and then the front door opened and closed and I was there alone… with the Admiral. Four months, I thought, it’s only four months and twenty-two days, then I’ll start my internship, I’ll be with Tony, and I can get on with my future. I walked forward to the doors until I saw the Admiral. My mother’s mother stood straight and tall behind her desk. Like the one picture my mother had, she wore her service uniform. The tan uniform was crisp and sharp. She had a cluster of service ribbons on her left breast, of various bright colors that stood out sharply. I was surprised by how young she looked, but then I realized that she must have had life extension treatments, so she wouldn’t age at the normal rate. Her blonde hair, tied back severely, was the same color as my mother’s, the same light blonde as my own. She was a thin, severe presence, one that suggested iron discipline and total focus on duty. There were sharp lines carved into her face, which made her look even more stern and foreboding. For just a moment, I contrasted her with my other grandmother, Grandma Effy, who ran the archaeologist program at Nelson’s University, was a warm, plump, friendly woman who baked cookies every Sunday. The Admiral did not compare favorably. “What?” I asked, surprised that she had guessed. I glared at her, “I’m not an Armstrong, I’m Jiden Nadami.” I used my father’s name, most times, because that’s what my mother did. Still, I knew that my birth certificate said Jiden Armstrong. I was an Armstrong, but it seemed best to not let her push me around from the start. I didn’t deny her assumption. She probably had some kind of camera or something installed in the library, anyway. “I have a name,” I said. I didn’t answer. Part of that was confusion, part was irritation and anger. Bad enough to be lectured by my mother, did I also have to hear it from her mother? Also, how was I supposed to interact with the woman I had never met, the woman who my own mother had barely talked with for over three decades? “You’ve a good bit of your mother in you, I can see,” her grandmother said, “Stubborn as a mule, she is. Probably got her temper too, I’d bet. You take after her, in some ways. Plenty of your father in you, though that’s more about the eyes and your size.” My father was medium height and dark haired, my mother as tall and blonde haired as my grandmother. The mix had meant that I was of average height and while my eyes were as blue as her mother and grandmother, they were shaped much like my father’s. My older brother had inherited our mother’s height, but our father’s dark hair and eyes. “Thirteen,” I bit out, angry that she didn’t know my age. Grudgingly, I added, “I turn fourteen next week.” Fourteen years on Century was almost eighteen Earth years. Seventeen and half, I thought, and I would be considered an adult practically anywhere else. Here, though, I’d still be considered a “child” for another two years. Like everything else in my life, it seemed like the length of year was terribly unfair. Fifteen months for a rotation around our star… thirty more months before I was an adult and able to make my own choices. I didn’t respond. I wasn’t sure what that had to do with me. I knew, vaguely, that the Admiral ran Century’s Military Academy. That reminded me of Tony’s father and his jokes about the prim and proper dress of their cadets and the military precision they followed for the rather tiny military forces that Century could afford. “Congratulations, Jiden, I’ve just approved your application to the Century Military Academy Prep School,” the Admiral smiled slightly. Dad had offered to fly us, but Mom had said that she needed to do it. I would have preferred to fly with Dad. He, at least, would have kept up a conversation to distract me. Mom just operated the settlement’s skimmer in silence. I wanted to talk at that point, to try to reason with her, but I knew it would just end up with another argument. Besides, setting in silence might give her the opportunity to realize what a mistake she and Dad had made. They couldn’t send me to live with the Admiral. For one thing, Mom only talked to her twice a year. Once on Christmas and once on Easter. It was pretty much the only times I’d ever seen them talk and even then, about half the time their conversations turned into drawn-out arguments. Sort of like our conversations, of late, I silently admitted. Mom never called her ‘mother’ or referred to her as anything other than ‘the Admiral.’ I’d taken to doing the same thing, mostly because I couldn’t very well call her Grandmother. That would be too weird if I tried to compare her to Grandma Effy. Grandma Effy baked delicious chocolate chip cookies and displayed pictures of her children and grandchildren. Grandma Effy ran the archeological department at Nelson’s University. The Admiral… well, I really didn’t know what she did. Military stuff, I assumed. I didn’t really know much about Mom’s mother. Sure, I knew the history book stuff, she’d single-handedly saved Century and all that. Well, not really single-handedly, and really, some folks argued that we’d be better off as part of the Dalite Hegemony. Still, she did some heroic stuff. She was one of the oldest officers still in service in the Century Planetary Militia. She still served as a reserve commander of a unit, if I remembered right, and she also served as the commander for the Century Military Academy. Mom didn’t seem to find military service all that heroic or maybe she just didn’t want to live in her own mother’s shadow. Either way, she hadn’t had anything to do with the militia from the day that she graduated her secondary school. She’d gone into archeology, instead, which was why our family had ended up at Basalt Mesa Outpost, about as far from civilization as anyone could be on Century, which was saying a lot for a desert planet on the frontier of human space with a population just under a billion. It seemed dreadfully unfair to me that Mom was so critical about my desire to go into another field when she did the same thing. Still, I kept quiet. I could tell that Mom was conflicted about this whole plan that Dad had put forth. I had to hand it to him for being devious, but that didn’t mean I had to appreciate it. Oddly enough, it made Mom and I allies, both trying to figure out a way to avoid what was coming. Silence was my best gambit in that, I knew. If I gave her long enough to stew about it, she would see how ridiculous it was to send me to live with the Admiral. I kept stubbornly silent. I knew I’d crossed a line when I forged her signature. Still, it was her stupid “bargain” that drove me to it. That and the fight with Dad when he refused to sign it. At least my rebellion had paid off. I had been accepted to Champion Enterprises Internship Program. So what if I had broken her bargain? It wasn’t like she had made it so I could keep it, not and still be able to get the job I wanted with Champion Enterprises and to be with Tony. And as far as Dad… well I’d shown him, too. I couldn’t help a retort at that, “You think I couldn’t think that up on my own? I’m not stupid, you know.” Still, I could privately admit that he had encouraged me to forge her signature. He had pretty much predicted how my parents would react about it all, too. Well, he’d said they wouldn’t know what to do so I’d get off basically without a hitch and he’d also assumed my dad would lose his temper. But I was secretly relieved that Dad had kept his calm and not even Tony could have predicted the Admiral. I grimaced, but I couldn’t argue there. Century’s capital was an awesome place, from what Tony and his father had told me. Lots of things to do, no water rationing, and I was sure Tony was living pretty comfortably. I hadn’t had a chance to call him, not with all privileges revoked by my parents. I was pretty sure what his response would be, though. I could almost see his confident smirk and him shaking his head and rolling his eyes at the injustice. I nodded. The embarrassment burned on that though. My parents had deactivated my net access. Which meant I had to get them to authorize me to download the preparation classes for the internship. They had only authorized that, which meant I couldn’t even update any of my friends on what had happened. I clenched my jaw in anger. That had been overboard, I thought, for all they knew, I could be dead or grounded and the worst part is that I couldn’t get any sympathy from them over the unfairness of it all. “Well, depending on what the Admiral has planned, you should have plenty of time to do your coursework,” Mom said. I caught a tone of uncertainty in her voice though. I wished I’d been able to overhear the conversation between her and the Admiral. My brother, Will, was there, but he said it was pretty calm. Just a quick call, some pleasantries, and then Mom told the Admiral what had happened and asked if she’d be open to having me stay there for the five months until my internship started. I was pretty sure it would be awful. Tony and his whole family had poked fun at the Century Planetary Militia, with good reason. I mean, sure, they defended the planet and all that. But they also wore their funny tan and brown uniforms and their shiny black boots and followed such weird traditions. Tony’s dad had a hilarious impression of them that set us both just rolling with laughter. Granted, I hadn’t understood most of it, but Tony’s family and some of their friends seemed to think it was great. I was certain that the Admiral would be arrogant and tyrannical. I mean, Mom had done everything she could to get out from under her and basically didn’t talk to her; she had to be some kind of petty tyrant. Four months, twenty-two days, I thought, and then I can start my internship. We continued the rest of the flight in silence. Mom settled the skimmer on the edge of the airfield. I noticed a low black form of a ground car at the edge of the tarmac. Mom started the shutdown procedures on the skimmer and I listened to the turbines whine down. A moment later an older-looking fellow in a suit climbed out of the vehicle and walked towards us. “Thanks, James. How is the Admiral?” Mom asked. “Busy, as usual,” James said. “This is the young miss?” He nodded at me. His behavior was peculiar and left me wondering what planet he came from. “Yes, this is my daughter, Jiden,” Mom said. “Well, it’s nice to not have to crane my neck looking up at someone for once,” James said good-naturedly. He was referring to the fact that my mom was tall, right at two meters. I got my dad’s height in my last growth spurt, but I had the feeling that I wouldn’t be getting any taller. I just gave him a nod. “Your bag, young miss?” he asked. Before I could do more than nod, he took it off my shoulder and led the way to the ground car. I was confused and glanced at my mother, but she just walked to the back of the ground car. Before she had arrived, James held the door open for her. Mom thanked him and got in. I was still confused, but I followed her. James shut the door behind us. “Ah,” I said. I hadn’t realized that the Admiral was loaded. I guess that made sense, though it seemed silly to have a servant. Tony’s family had robots and house automation to do things for them. Their skimmer was even an automated job, which was how Tony and I were able to slip away with it, neither of us knowing how to fly one, after all. “The Admiral hasn’t had many guests?” Mom asked. “Young miss Melanie and master Rawn came in on ship last month. Not a one since them,” James said. I guess that he meant my cousins, Mel and Rawn. Uncle Hans and Aunt Anne Marie, their parents, had been killed in some kind of terrorist attack off-world, and Mel ran their freighter. They’d visited us last month as well. Mel was much older than me, but she was nice enough. Rawn was younger than me, but he’d seemed pretty interested in some of the classes I was taking. I guess he had a more limited selection aboard their freighter. I’d enjoyed some of their other visits better, especially when I got the opportunity to go aboard their ship. “I thought the Admiral was still in service, you haven’t had any military functions?” Mom asked. They talked for a few minutes about places and people I didn’t know or hadn’t heard of and I just tuned them out. I was confused by this odd man that seemed so familiar with Mom. She’d never mentioned him, but she talked to him like an old friend. He seemed nice enough; the situation just felt odd. He didn’t even behave like a servant should, he told jokes (none of which I understood) and even teased my mother about rebellious teenagers. I just sat in silence, right up until the ground car pulled up in front of a big, stone house. It wasn’t a mansion, just a large house, three stories of carved blue sandstone. It looked like it was from Founding, crafted from available resources and designed to last. I’d read in some of my history courses that early on the first settlers had built houses so that whole families would live under one roof. Now, with more technology and equipment available, there was more room to spread out. I shuddered at the thought of having to live with not just Mom, but also the Admiral, Dad, and my cousins in the brooding pile of stone. Thank God that I don’t have to live like that, I thought. Tony had mentioned Champion Enterprises provided their interns with their own private apartments. That would be ever so much better than living here. I lay awake atop my covers as I listened to my parent’s raised voices. I wasn’t sure if they figured I was asleep or if they just didn’t care if I heard at this point. For all I knew, they’d forgotten that I was even in the house. “I don’t know what to do with her, Wayne, I just don’t,” My mom said. She still had that tone of resentment that had set me off earlier. That had escalated into this, but somehow it just didn’t seem fair that she could raise her voice and I couldn’t. “Don’t you dare take her side on this,” Mom said. Just like her, I thought, she doesn’t like what I’m doing so she tries to make it out like I’m the one who didn’t hold up her end of the bargain. I had… mostly. Well, admittedly, I’d promised to apply to the Archeological Institute and Nelson’s University as well, but it was hard enough filling out just the application to Champion Enterprises Internship… and they had requested that I make my application exclusive. They would have thrown my application out if they knew I had applied somewhere else. I winced at that. It was true enough. I knew she wouldn’t sign it and I knew that Dad would have wanted to talk it over with her before signing it. The two of them were almost a hive mind with how they managed Will and me. That was part of why I’d gotten so angry with both of them, they were too good, and it was almost sickeningly wholesome around the house. That hadn’t bothered me even a year ago, but it did now. I was nearly fourteen years old, which with the longer years here on Century, meant I was already seventeen in Earth Years. Back in more civilized places where they followed the Earth calendar, I would almost be considered an adult. I’m so sick of them treating me like a child, I thought, I made this decision myself and they should respect it. “I know,” I heard my dad sigh and that made me wince again. Dad was big on keeping your word and being honest. And I tried, but at the time it had seemed like my only option. I’d done almost everything else they had required of me. I’d taken the archeology classes like they asked, I’d done all the additional course work they wanted, I’d even stayed on top of the chores… well the ones I hadn’t traded with Will, anyway. And really, who cared if I traded allowance money for Will taking some of the worst chores? I didn’t have time to clean the bathrooms, I was doing all that extra work. A quiet voice inside of me reminded me that I’d still had time to hang out with Tony. I’d also had time to attend the Basalt Mesa Outpost school graduation dance. Come to think of it… I ambushed that quiet voice and shut it up where it wouldn’t gang up on me with my parents. I was the wronged party here and I refused to give in on this. I had earned that internship and I was not going to take it away from me. “I don’t care,” her mom said. “She lied to us, Wayne. If we let her get away with that… then what lesson does she learn? That if she’s clever enough, she gets what she wants? Because I don’t think that’s right.” That wasn’t what I think at all, I countered in my head, though I will admit that I did think it all through very well. There wasn’t anything they could do, not without destroying my future and I knew they cared too much about me to do anything like that. “You’re right,” her father said. “She does need to come away from this with some lessons… and I think I have an idea.” I felt a sense of unease. I thought I had considered every option. The trimester school system had just wound to a close. I’d graduated my secondary school in the second trimester, which meant I had just over five months until the first trimester of university classes began. Normally, that gave kids my age a break before they started training in earnest for their careers. Some got temporary jobs, but most kids my age would spend the time either studying for their classes or enjoying the last break before they had to buckle down and attend university. Personally, I’d planned to spend most of my time studying. Champion Enterprises was the opportunity of a lifetime. Their employees made more money than almost anyone else on Century. Their boss, Leo Champion, was one of the primary shareholders in the Century Colony Charter. He owned something over thirty percent of the star system. Tony had earned an internship with their logistics department last year. He was still an intern, but he already made more than my dad did. “There’s always her grandmother,” Dad said, his voice oddly reasonable. “No, June, I meant your mother.” My dad said it in that same smug tone of voice he used when he knew he was being devious, like when he beat me at cards or when he had figured out some archeologic puzzle.